A possible inspiration for a Thomas Kincaid painting; we think this antique cottage is an exact description of the near-perfect traditional Maine vacation cottage, great porch overlooking a beautiful harbor, within walking distance to the village, sandy beach, and a famous Maine lighthouse. Sunsets in the evenings on the porch can create a lifetime memory of the best of Maine. This cottage has many repeat renters that come back year after year, generation after generation. Beautiful Drift Inn Beach is just 1.3 miles away. It's like stepping back in time when you stay at this cottage. While there is internet and a Smart TV with basic cable service for a possible rainy day or catching up on the news, cell service is spotty here, but there is a landline phone, so plan to relax and disconnect during your stay. 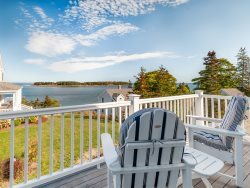 There is a truly unobstructed, spectacular view of this working fisherman's harbor off the covered porch which provides serenity, relaxation and the quiet you have been looking for. This cottage is rustic and most of the features are antique, but it provides all the necessities to make a stay here easy. Furnishings are quite old and not as comfortable as some seek, although a new comfortable couch was added to the living room for 2016. Staying at this cottage is a step back in time to the way people vacationed in Maine during the early 1900's - but with some modern conveniences. The TV in the cottage is set up to direct to the dining table so one can catch the news of the day, but is not set up for comfortable viewing in the living room. The owners have done extensive renovations the past 10 years including kitchen, bedroom and bathroom updates. Many ocean views can be enjoyed from this peaceful five-bedroom, two-bathroom village location. Watch the sun set on the front porch within close sight of islands and fisherman unloading their catch. Play on the yard between the house and the neighbor. Heat Source: There are two baseboard type electric heaters that can be placed in each of two bedrooms during the shoulder seasons to take the chill off while sleeping. The fireplace can be used to heat the living room and kitchen area. Amenity Disclosure: The Owner of this property does not provide all the typical amenities found in an On the Water in Maine vacation home. There isn't an outside dining tables to fit 8 people (only fits 6). On the Water in Maine was great to work with. Everything went smoothly. We greatly enjoyed our stay at Marshall Point Cottage. Sitting on the porch, looking out over Port Clyde harbor is hard to beat. We always enjoy working with On the Water in Maine. Very professional. Loved the house and the location. Felt as if we were back in old Maine. Watching the lobster boats coming and going from the porch swing was idyllic. On the Water in Maine was a great rental company to work with. They were always helpful and friendly on the phone prior to our vacation as we made our arrangements. During our stay we had one minor request that was not urgent at all, yet they immediately came out to take care of the issue. We would highly recommend On the Water in Maine. We absolutely loved our stay at Marshall Point Cottage. The cottage was exactly what we were expecting. The location was perfect and we loved the rustic, simple cottage style. The kitchen was spacious and well equipped. The porch was our favorite part and we loved enjoying our morning coffee overlooking the harbor. It was nice to be able to walk to the village for breakfast or ice cream and we also enjoyed our walks to the lighthouse. We had one night that was unseasonably cold (50s) and stormy. Justin, from On the Water in Maine, called to see if we were OK in the house as it has no heat and if there was anything we needed. That's above and beyond service! Marshall Point Cottage was lovely. A short walk to the lighthouse after a dinner on the deck oceanside - what more could you ask for. Kitchen was well supplied. Marshall Point cottage has spectacular views, we fell in love with Port Clyde and the area in general. Everything was handled efficiently and professionally. One of the best rental experiences we have had. This is a very charming house in a great location near Port Clyde. The view of the harbor from the porch in the evening is wonderful. Outstanding, nothing bad to say! The view was awesome! Also the property is very well kept. I have always had excellent experiences interacting with all the On the Water in Maine staff, particularly Justin. Thank you for the opportunity to stay in your lovely house, we want to return next year for sure! The best feature of Marshall Point Cottage is the relatively secluded location and the lovely view from the large covered porch overlooking the harbor. It was also within walking distance to the Marshall Point Lighthouse, and to the town of Port Clyde. Justin at On the Water in Maine was great to work with...and answered all of our questions and made us feel very comfortable with choosing Marshall Cottage for our stay. He also provided good training on the boat to ensure that we were comfortable with all the ins and outs of the boat. This property was ideal in location. It was on a quiet street that we did not worry about the kids walking on, it was close to a dock so the kids could fish and we could moor a boat, and it was an easy walking distance to Port Clyde town and Marshall Point Lighthouse. Not to mention that the views were amazing! Thank you so much for sharing your home with us. The view was absolutely amazing and we made many wonderful family memories here. We hope to return in the future.